He moved to Bloomington, Minnesota when he was a young child. 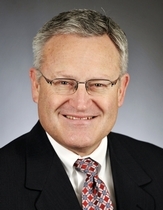 He was an unsuccessful candidate for the Minnesota Senate in the 1982 election. He was a member of Wooddale Church in Eden Prairie, Minnesota. Schmidtke, Erin. "First and Last Term." Session Weekly, St. Paul: Minnesota House of Representatives Information Office, March 30, 2012, p. 21. Busse, Nick. "A Brighter Future." Session Weekly, St. Paul: Minnesota House of Representatives Information Office, January 21, 2011, p. 16.